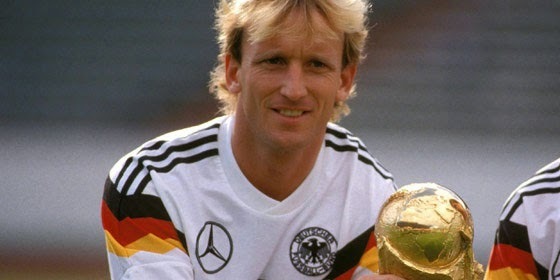 For those of you that have been watching football for a long time the name Andreas Brehme shouldn’t be an unknown, but for some the scorer of the winning goal for Germany against Argentina in the 1990 World Cup may be a bit of an unknown. The man, who scored the goal that defeated the Argentina of Maradona and Caniggia, has been forced into a life of less glamour than what he was used to during his glory days. 24 years since he scored a goal that made him a hero, and reports surface now that the German World Cup star is bankrupt, with debt of around €200,000. A bankruptcy court date has been schedule for December of this year. Former players like Franz Beckenbauer has mentioned publicly that the former German international needs help and that German football owes him a debt of gratitude for what he achieved for his country, but all have been nothing more than just words. Nobody has step up to help Andreas Brehme, with the exception of former teammate Oliver Straube who owns a bathroom maintenance company. Straube has given Brehme a job cleaning toilets for his company. Not the most glamorous of jobs but a job that will help him earn some money so he can at least live his life above poverty levels. I am not sure it is the responsibility of a nation or the football association to look after a former player that didn’t manage his finances as well as perhaps he should have. If former players like Beckenbauer are serious about helping perhaps he could do more than just talk and help Andreas by finding him a role or a job at a club or even the German federation. Or maybe what Straube is doing for him is what he really needs, and not just some handout that would see him squander just like he did with the money he earned during his playing career. Regardless of which side of the fence you are sitting on, scoring the World Cup winning goal to cleaning toilets is without a doubt one of the largest free falls a man could experience.